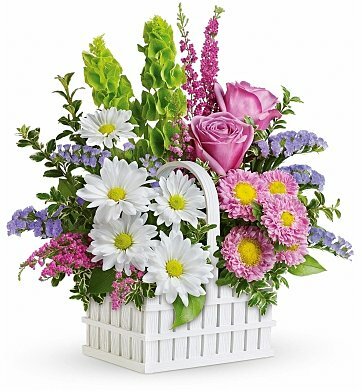 With elegant lavender roses, verdant bells of Ireland, pink heather, and more all arranged in a picket-fence basket, this Easter collection is the ideal way to brighten any home. Bells of Ireland, Pink Heather, Lush Greenery and more. Standard Arrangement Measures 15" x 14". Home for Easter Bouquet is a hand delivered gift. These gifts are delivered by one of our local design centers located throughout the United States and Canada. Same day delivery is available for most gifts when ordered before the cutoff time. The cutoff time for Home for Easter Bouquet is in the recipient's time zone. Thanks Mom, the flowers are beautiful! Absolutely perfect. The fresh flower basket was beautiful. Such a cheerful assortment of springtime flowers. Perfect for Easter/Springtime celebration.